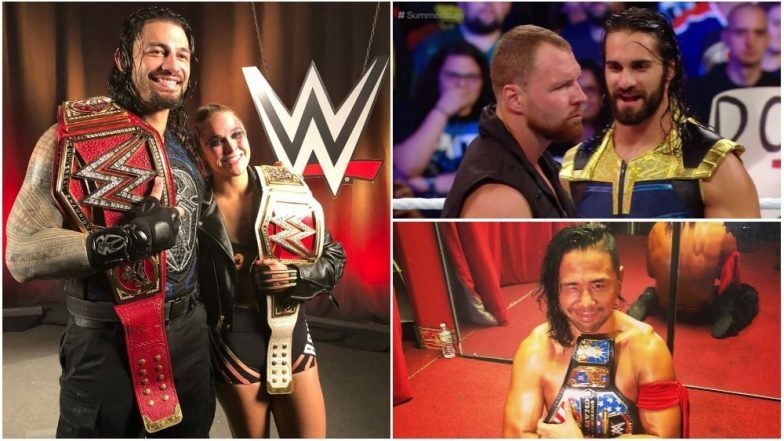 World Wrestling Entertainment's (WWE) biggest pay-per-view (PPV) after Wrestlemania, SummerSlam, began with a tag-team match between Rusev and Lana, and Andrade Cien Alma's and Zelina Vega, with the latter winning the bout. In the next match, it was WWE Cruiserweight Champ Cedric Alexander who defended his title against Drew Gulak. The third match, and the final before the kick-off saw the B Team and The Revival embroiled in Raw Tag-team Championship match, which was eventually won by the former. WWE SummerSlam 2018 show kicked off with a bang as the first match in the night saw Intercontinental Champion Dolph Ziggler (with Drew McIntyre at ringside) compete with Seth Rollins (who had a returning Dean Ambrose by his side). In the early moments of the match, it was Rollins who had the upper hand, with Dean Ambrose able to neutralise Drew McIntyre's numerous threats. Eventually, it was The Architect who won the match and became the new WWE Intercontinental Champion. The second match of the show saw The New Day challenging The Bludgeon Brothers in the SmackDown Tag-team championships match. The match ended in a no-contest as The New Day won the match by disqualification after Eric Rowan used a sledgehammer during the bout. Next-up was Braun Strowman vs Kevin Owens. The match ended without any fanfare, and it was the Monster Amongst Men who won it in no-time, easily. The first women’s wrestlers match saw Becky Lynch, Charlotte Flair, and compete in a Triple Threat match against SmackDown Live Women’s Champion Carmella in the title match. The evenly-fought contest saw Flair taking advantage of the situation, wherein Lynch had locked Carmella in her submission manoeuvre. Flair pinned his friend, Lynch, down for the win. After winning the SmackDown Women’s Championship, Flair was attacked by Lynch, much to fans’ delight. Fans chanted ‘you deserve it’ as Lynch marched back to the locker room. WWE Champion AJ Styles locked horns with Samoa Joe. The match was one of the finest in the night. The evenly poised contest saw Joe making personal remarks against Styles’ family who was present in the arena. Styles snapped and went on a violent spree against Joe. The WWE Champion couldn’t hold back as he started hitting Joe with a steel chair. The match ended with Joe winning it by disqualification. Another great bout in the night was between The Miz and Daniel Bryan. After years of an exciting build-up, the match saw both the superstars go against each other in equal measure. It was anybody’s contest until the Miz hit Bryan with a foreign object that he took from his wife Maryse, who was standing by the ringside. The referee didn’t notice, and it was the Miz who eventually won the match. Finn ‘The Demon’ Balor returned to WWE after nearly a year to face his opponent, Baron Corbin. Balor took advantage in the early moments of the match and eventually went on to win the match in a brief time. Next up was US Champion Shinsuke Nakamura vs Jeff Hardy. Both the SmackDown superstars tried every trick and move in their book during the gruelling contest. However, it was Nakamura who won the match and retained his championship title. Alexa Bliss fell short against Rousey in her title defence at the PPV. Rousey locked Bliss in her submission move ‘armbar’ as the latter tapped out. Rousey, with her athleticism, had impressed many since she made her debut in the WWE. It was only time that she became the RAW Women’s Champion and what better time can it be than being the champion at SummerSlam? The main event of SummerSlam 2018 saw WWE Universal Champion Brock Lesnar defending his title reign against Roman Reigns. However, even before the match began, Money in the Bank winner Braun Strowman marched out to the ring and dished out a challenge to the winner of the match. The referee rung the bell, and it was Reigns who took control of the match in the start. Reigns hit a few ‘superman punches’ and a hat-trick of ‘spears’. To everybody’s shock, Brock locked Reigns in a guillotine choke on the third ‘spear’. It was then Lesnar who took control of the match. After a few flip-flops, Reigns' ‘spear’ turns into a ‘suicide dive’, after Lesnar moved out of the way. Lesnar tried to neutralise Strowman while battering him a steel chair, while Reigns recovered in the ring. Just as when Lesnar entered the ring after the brutal beating, Reigns hit him with another Spear, this time for the win! The Big Dog became the new Universal Champion. SummerSlam went off-air as Reigns posed for the cameras and played to the gallery!